West Mountain Regional Health Alliance (WMRHA) formed as a regional entity in 2010 to examine the access to care gap of prenatal care for low-income women in western Eagle County. This lead to a collaborative Prenatal Program between Pitkin County and Eagle County. The success of the entity highlighted the need for the group to continue its efforts to identify issues and seek regional solutions. In order to do so, the alliance expanded to a broader community alliance that it is today. Today the WMRHA consists of members from many sectors of the healthcare industry, including: healthcare organizations, public health, human services, clinical providers, schools, private sector, and community organizations. 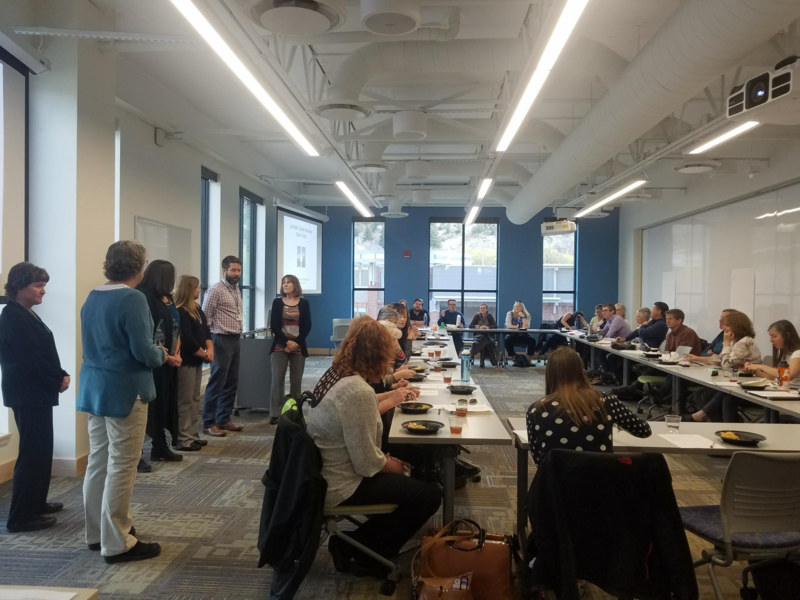 All of these groups are committed to creating an integrated healthcare system (physical, behavioral and oral health) in Eagle, Garfield, Pitkin and Summit counties. The Alliance creates a neutral space for "multi-sector and multi-stakeholders" to convene, identify, understand, and work together on regional issues to create solutions. WMRHA works in collaboration with the members to address large, system-level healthcare challenges through alignment of initiatives and efforts and advocates for access to care. West Mountain Regional Health Alliance's Quarterly Meeting, April 9th 2018. WMRHA honored Nan Sundeen, Pitkin County Human Service Director with the “Community Health Hero” award for her leadership and support of the Alliance as a founder, a board member, and an active collaborative member. Nan continues to be involved in a meaningful way to ensuring championship of efforts to serve the people who are the most vulnerable in the community. We are so grateful to Nan for her vision and continued engagement. Sharing of Community Health Assessment Planning Study (CHAPS) data led to a shared public health planner and coordinator for tobacco prevention and cessation in Eagle, Garfield, and Pitkin. 2016, WMRHA was awarded a Network Planning grant from Health Resources Services Administration (HRSA). Development and implementation of the Pitkin/Eagle Prenatal Program to provide access to prenatal care and deliveries for low-income women in western Eagle County. 2017, WMRHA hired its first executive director. WMRHA received a SIM ( State Innovation Model)/ENSW (Evidence North South West) grant to hire a Regional Health Connector, one of 21 in the state.